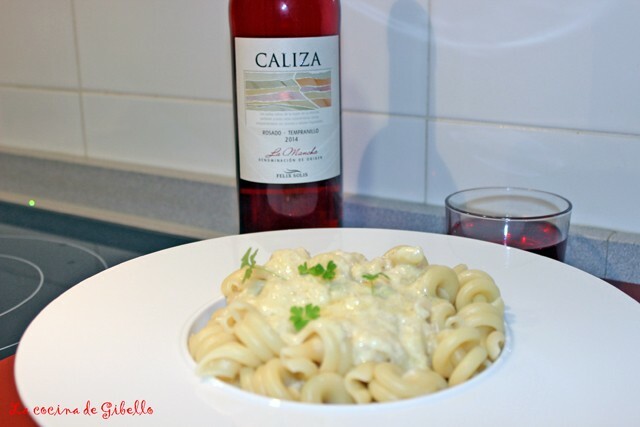 Our wine Caliza Rosé is a light, clean, fresh and fruity wine. It has the original strawberry aromas and red berries typical from the grape tempranillo. The flavour is balanced, fresh and has a clean and long finish. It is the ideal partner for pasta dishes. Here, David Gibello recommends a recipe to accompany this rosé wine of the appellation DO Mancha. Melt the butter in the span and 125 grams of mozzarella mixing with a spoon, until we have a creamy sauce. Add the milk and continue stirring, add a spoonful of powder of garlic and black pepper as desired. Stir everything. When the mix is homogeneus, add the sliced emmenthal cheese. Leave in the pan for a fee minute without adding more heat. In a cooking bowl, boil water. When waiter is boiling, put the pasta and boil for 13-15 minutes, depending on the taste you like. When pasta is cooked, drain the water and serve in plates. Add the sauce. Decorate with some persil. Serve with a cold glass of Caliza Rosé from DO Mancha.